I have been using Diving log for a number of years, currently using version 6.0.4 Update 2. No directory was created on the SD card for me to sync to. I uninstalled and deleted the directory in the internal storage, set the app install location preference to SD, and reinstalled. It still installed in internal memory, not the SD card, and created no data directory on the SD card. 2) Manually create a directory on the SD card. This is very kludgy, especially for a limited functionality app - it does not do much, so I would expect it should at least be able to do what it says it will. The app is not expensive in the grand scheme, but the quality is way below what I see in many free apps, and certainly not up to the standard I have come to expect after using Diving Log on my PC for a number of years through several versions. I don't think it's allowed to run from the SD card. I have several other apps on my phone that are like this (doesn't matter how you set it as far as install location preference). I think it has to do with some thing that came about in Android 4. "something" that has to do with access to the SD card. - The installation location of the app (internal or on SD card) has nothing to do with the logbook directory. The app can be installed internally, but the logbook folder can be on SD card, not related at all. Changing the app installation to external won't change the logbook location. It's like on the PC, the application folder and the logbook folder are two different things. - The "Diving Log" logbook folder is created only when you start the app. Android apps cannot create any folders during installation. So if you never started the app, you won't see the logbook folder. You don't have to create the folder manually. - You have to select the logbook file in the app the first time, if the logbook name is not "Logbook.sql". Open the app drawer and tap on "Manage Logbooks". Select your logbook in the list and tap the "Check" icon. The Android system is very fragmented and every manufacturer does different things to the OS, so it is difficult to understand the possible device configurations. You have to understand that this is the very first version of the app and I'm new to Android myself, so I have to learn a few things. In future versions syncing via Dropbox and Google Drive will be implemented, which makes things a lot easier. You can use that even today. Sync from Diving Log desktop to Dropbox, OneDrive or Google Drive using the "Web" toolbar menu. Then open the sync app (Dropbox etc) on the phone and save the *.sql file from the "Divelog" folder to the "Diving Log" folder on your phone and you're done. Clarification: I don't care about installing to the SD card, this was a troubleshooting step only after nothing else worked. Offered only for completeness, and to point out that it does not adhere to set preferences. The logbook location was NEVER created by the program, neither by install, nor by starting / initializing, nor by creating a new logbook from within the app (which also provides no choice as to where to save). This is a KEY issue. The only way I was able to copy my log to the phone was as described, utilizing a MANUALLY created directory, changing the connection type, and manually copying from the SD card to internal memory. As to Dropbox and Google Drive, I have no desire to create accounts with either or put any of my data there. I paid for the app with the expectation I could sync directly, simply, and quickly with my computer. This is the only reason I paid for the app. I am quite happy with the PC app, have been for several years, and plan to continue using it. I am tremendously disappointed with the phone app. It is not ready for prime time. You don't have to pay to sync your logbook file at all. Syncing with the desktop version is free, just the editing functions on the phone require the in-app purchase. Regarding logbook location: it seems that there are actually two "SD Card" options on Android, one emulated SD Card and one real SD Card (if available). Diving Log seems to default to the emulated SD card for the logbook storage, which does not seem to be surfaced via USB on some phones. I'll see if I can add an option to select the SD card in this case. Was able to just save the SQL file and then open it in the app. Looking forward to the ability to select the file from Dropbox -- I would pay for that feature. Has there been any progress on this? Actually, per the attached, from Windows Explorer, I can see both internal and external storage (left window). 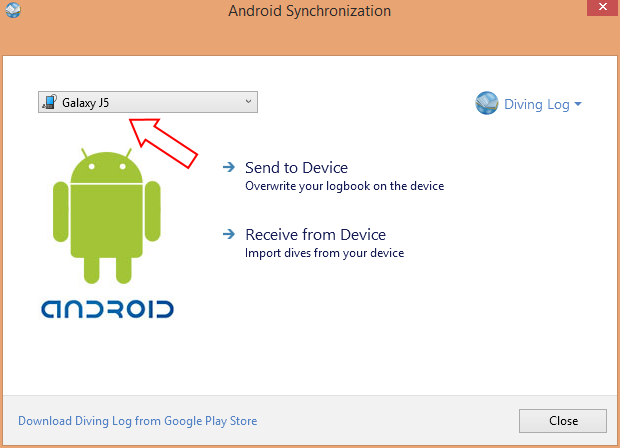 As you can also see, selecting the save as folder on sync from the Diving Log 6.0 desktop application does NOT allow me to see the phone at all (right folder). If I choose the sync to phone option, it will put it on the card, but I then have to manually move it to internal storage. MTP Synchronization is now implemented in the latest version. It should automatically sync the logbook file to the "Internal storage", sub folder "Diving Log". Are you sure the MTP sync saves the file to the "SD card" and not the "Internal storage" location on your phone? The "Save as" function cannot save files to MTP connected devices, so it is normal that you don't see the phone there. Between the new Android version and Diving Lob 6.0 this is THE BEST combination for a mobile log. Awesome job!